Who Needs The MVP? Mike Trout Might Be The G.O.A.T. Mike Trout reacts after hitting a triple in the ninth inning against the Texas Rangers this season. The MVP snubs keep piling up for Mike Trout of the Los Angeles Angels. On Thursday, Josh Donaldson of the Toronto Blue Jays bested Trout for Most Valuable honors in the American League. It’s the third time that he’s lost in a year when he led the league in wins above replacement (WAR). (The guy’s only been in the league for four official years, mind you.) Aside from his win over a not-so-crowded field a year ago, voters seem determined to find reasons that Trout shouldn’t be MVP. But Trout can take solace in this: He might be on pace to become the greatest player of all time. Each year that Trout has played a full season, he has ended the season as the all-time MLB leader in career WAR for his age. We all want to witness history, so it can be tempting to baselessly hype up current stars as all-time legends. But that can make it more difficult to appreciate true greatness in the moment. What’s the truth and what’s the narrative? In Trout’s case, the hype is justified and then some. After hitting the cover off the ball in the minors, Trout had a mediocre call-up year in which he hit 11 percent worse than the league average, judging by OPS+ (adjusted on-base plus slugging percentage).1 But he retained his rookie status for 2012 after missing the cutoff for eligibility in 2011 by seven at-bats. Since then, it’s been nothing but sustained greatness for Trout. Playing a full schedule for the first time in 2012, the 20-year-old Trout dominated, posting the 22nd-best season by a position player in MLB history according to WAR. While he may have peaked with 10.8 WAR that year — only four players (Babe Ruth, Barry Bonds, Mickey Mantle and Willie Mays) have had two seasons with that many WAR in their careers — his 37.3 WAR between 2012 and 2015 ranks as the 31st-best four-year stretch in major league history. And he’s the only player to put up such a run between the ages of 20 and 23; the next-youngest were Mantle and Ty Cobb, each of whom did it from age 22 to 25. What remains to be seen, though, is whether Trout being the best young player ever means Trout is tracking to be the best ever, period, full stop. Among the WAR leaders through age 23, some were like Cobb, producing good years into their late 30s and beyond; others, such as Andruw Jones, saw their performance fall off considerably after turning 30. Trout already has more career WAR than 96.9 percent of all players in major league history, but can he pass the other 3.1 percent? A quick-and-dirty way to estimate Trout’s end-of-career WAR pace is to use Baseball-Reference.com’s similarity scores in the spirit of projection systems like PECOTA or CARMELO. 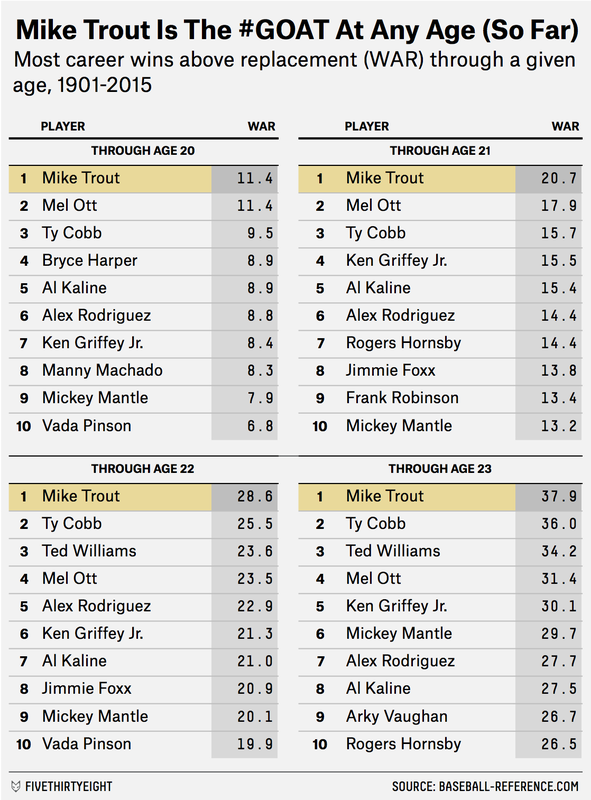 Through age 23, the most similar players to Trout include Mantle, Frank Robinson and Ken Griffey Jr.,2 although Trout’s WAR has been about 47 percent higher than his cohort of comparables. From age 24 onward, that group of similar players3 produced an average of 68.2 WAR. So if we think Trout will continue to be 47 percent better than them over the rest of his career, we would expect Trout’s future to hold 100.6 more WAR before he retires. Adding 100.6 WAR to his current total of 37.9, we arrive at a career forecast of 138.5 WAR. That’s a heckuva lot of WAR, but it’s not No. 1: That total would rank sixth among position players since 1901. If he plays until age 40, Trout will have to average 7.4 WAR per season4 to catch Ruth as the best position player. (And that’s not even considering the 20.6 wins of value Ruth added as a pitcher.) Being the best ever through age 23 is no guarantee of what will happen over the next decade and a half. Even so, Trout’s career has started off unlike anyone else’s in MLB history. Although he has only one MVP to show for it (for now), it’s a remarkable achievement to be the G.O.A.T. through any age — much less every season you’ve played. Although even then, he was ahead of the curve; the average 19-year-old non-pitcher since 1901 had an OPS+ of 78. Miguel Cabrera is a fun inclusion at No. 5 — he beat Trout for MVP in both 2012 and 2013. Essentially top-5-in-MLB production by 2015’s standard.